One of the primary symptoms of anxiety is indecisiveness. If you struggle with any form of anxiety, you can most likely relate to often being handicapped with decision making. The reason for this is because you are most likely going to be worried about the consequences of your decision. The main issue with anxiety is the illusion that the sufferer cannot handle things going his way. This then creates a habitual sense of dread when it comes to making decisions. If you experience occasional to frequent bouts of anxiety, you should know that your sense of dread comes from your reptilian brain. Your reptilian brain, consisting of your brain stem and cerebellum, is responsible for some very important automatic activities in your body. Activities such as breathing, body temperature, and the fight or flight response system. The reptilian brain is reliable; however, it is limited in its ability to distinguish between a life-threatening situation and an inconvenience. This is were the neocortex comes in. The neocortex, also referred to as the brain’s thinking cap is believed to have almost infinite learning abilities. Regardless, the neocortex is responsible for being able to assess a situation which triggers anxious feelings in you. It also helps you determine why and if you should find the situation anxiety provoking. If anxiety is something which you struggle with, you will need to learn cognitive skills to experience more calm. This is to teach your brain how to quickly transition from anxious feelings to a sense of calmness and resolve. One of the first cognitive skills to learn is how to reduce overthinking and become more decisive. In this post, we go through three important steps towards practicing this technique. Let’s say you are looking for a new job. You have just graduated from college with a degree in business management. Then you take to the internet and submit your resume along with a generic cover letter. To your surprise, you receive an email from three potential employers who have expressed interest in hiring you as a junior manager. Further, let’s say the first job is for a new restaurant, the second job is for a local construction company and the third job is for a marketing firm. You have completed interviews with all three companies over the phone and they have all invited you for the second interview in person. Then you find yourself at a loss of what decision to make. You are certain that you will be hired by all three companies, but you are concerned if any of them are the right fit for you. The solution to this is to create a vision, regarding what type of job you want. Ideally, you will want to do this before submitting any resumes or cover letters. The technique to accomplish this is to write down on a blank piece of paper, specifically what type of job you are looking for. You will be surprised how difficult some people find this activity to be. When writing down what you want, you want to be realistic, regarding what you know you are capable of accomplishing, while at the same time, you don’t want to fall for the trap of restricting yourself. Your vision should be bold and specific. For example, I want to use my business management degree to begin working as a manager for a social media marketing firm, with a starting salary of no less than $60,000 a year with paid annual vacations. If you are struggling to come up with something bold and specific it will help to come up with what you find inspiration with and proceed from there. Once you have created a vision, that details what you want, you will need to create a backup plan. Your back up plan should mirror the analogy of being willing to make a U-turn once you discover that you have been heading down the wrong road. For example, let’s say you attend the second interview with the marketing firm and you are offered employment only to discover that it was the wrong decision. What are you willing to do if this happens? For something as complex as this, you might want to come up with multiple backup plans. You could decide to stay with the company for about three years, to get some needed experience under your belt. Or if it is unbearable, you might plan to draft an apology and resignation letter to the company CEO or your immediate supervisor. The latter plan also entails addressing what you will do about income in the interim. Creating a tight budget for yourself, pending your experience with the company in the coming months is also another plan. Regardless, coming to a decision on what you will follow through on, if things don’t work out, increases your willingness to commit to a decision. Once you have created a vision and have made a commitment to follow through on your decision, what remains is to set a date and time. This can range from months, weeks, days, hours and minutes. It is important to remember that indecisiveness is a bad habit, and habits are difficult to break with people. It is important to create a healthy degree of pressure on yourself in order to increase the likelihood of follow-through. If all three companies offer you employment within their respective organizations, you are most likely going to make a solid decision if you give yourself a time frame. For example, I personally would commit to responding to all potential employers within one business day. 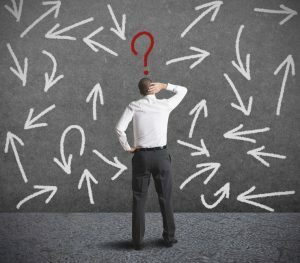 This technique is effective in helping people reduce overthinking and becoming more decisive. However, it is a technique that should be practiced consistently for at least of a period of 30 days, for you to experience a reduction in overthinking and indecisiveness. Ugo is a life coach and psychotherapist who specializes in social anxiety. If you would like to learn more or if you are dealing with anxiety or depression, you are welcome to call to schedule an appointment or fill out the contact form and click send.